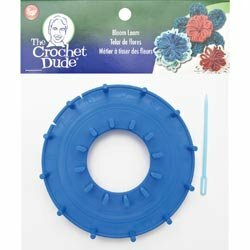 BOYE-The Crochet Dude: Bloom Loom. Making yarn flowers is easy with this loom! It can be used with any type of yarn and will make either 2- or 3-1/2 inch flowers. Instructions are included for making both single and double-centered flowers. Each package contains one plastic loom and one plastic yarn needle. Imported. If you have any questions about this product by Boye, contact us by completing and submitting the form below. If you are looking for a specif part number, please include it with your message. Wooky Entertainment Style Me Up! x -Loom Kit-Adjustable Beads Up To 18"